17.3.1944 - 3.4.2019 Peter passed peacefully at Peel Hospital after enduring 12 months of treatment for Cancer. Loved husband of Dorothy, Father of Jacqueline and Brett. Father-in-Law to Rob and Michelle. 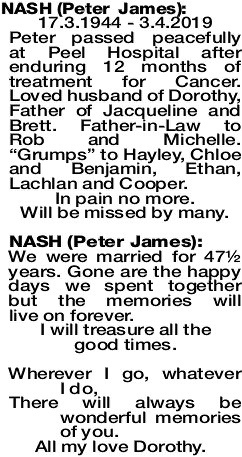 “Grumps” to Hayley, Chloe and Benjamin, Ethan, Lachlan and Cooper. In pain no more. Will be missed by many. We were married for 47½ years. Gone are the happy days we spent together but the memories will live on forever. I will treasure all the good times. There will always be wonderful memories of you. 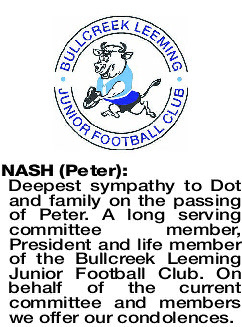 The Funeral Cortege for Mr Peter James Nash of Lakelands formerly of Bull Creek will arrive at the main entrance of KARRAKATTA Cemetery, Railway Road, Karrakatta at 2:30pm on THURSDAY (11.04.2019) for a Cremation Service. 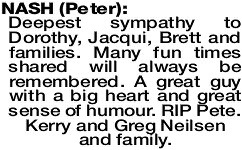 Please wear something bright and colourful in memory of Peter. 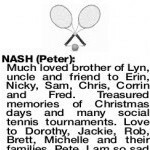 Much loved brother of Lyn, uncle and friend to Erin, Nicky, Sam, Chris, Corrin and Fred. 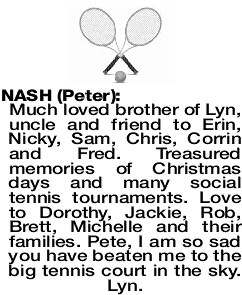 Treasured memories of Christmas days and many social tennis tournaments. Love to Dorothy, Jackie, Rob, Brett, Michelle and their families. 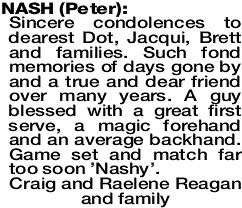 Pete, I am so sad you have beaten me to the big tennis court in the sky. Lyn. 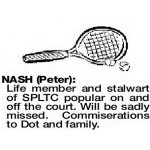 NASH PETER So many wonderful memories of Nashy and the early days at SPLTC. Was everyone's friend and always welcomed new members with open arms and a big smile. RIP Pete. 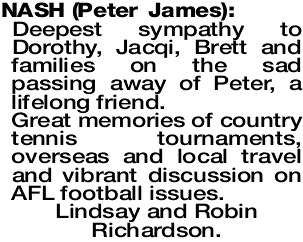 My thoughts are with you Dot, Jacqui and Brett. 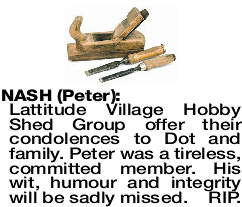 Lattitude Village Hobby Shed Group offer their condolences to Dot and family. 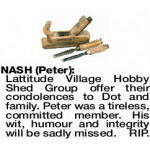 Peter was a tireless, committed member. His wit, humour and integrity will be sadly missed. RIP. In memory of years long ago when we all used to get together. Good memories of those days. Deepest sympathy to Dorothy and family. 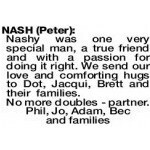 Nashy was one very special man, a true friend and with a passion for doing it right. We send our love and comforting hugs to Dot, Jacqui, Brett and their families. 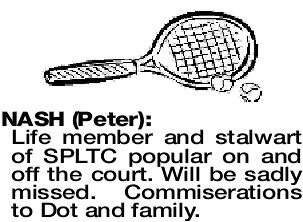 Life member and stalwart of SPLTC popular on and off the court. Will be sadly missed. Commiserations to Dot and family. 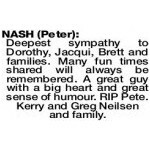 NASH PETER Deepest sympathy to Dorothy, Jacqui, Brett and families. Many fun times shared will always be remembered. A great guy with a big heart and great sense of humour. RIP Pete. Kerry and Greg Neilsen and family. 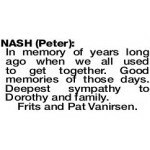 NASH PETER Deepest sympathy to Dot and family on the passing of Peter. 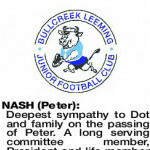 A long serving committee member, President and life member of the Bullcreek Leeming Junior Football Club. On behalf of the current committee and members we offer our condolences. 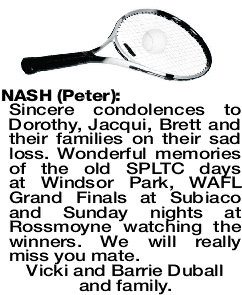 Deepest sympathy to Dorothy, Jacqi, Brett and families on the sad passing away of Peter, a lifelong friend. Great memories of country tennis tournaments, overseas and local travel and vibrant discussion on AFL football issues. 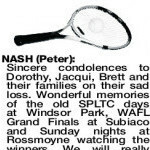 NASH PETER Sincere condolences to dearest Dot, Jacqui, Brett and families. Such fond memories of days gone by and a true and dear friend over many years. A guy blessed with a great first serve, a magic forehand and an average backhand. 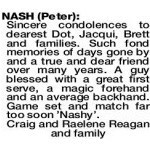 Game set and match far too soon 'Nashy'. Sincere condolences to Dorothy, Jacqui, Brett and their families on their sad loss. Wonderful memories of the old SPLTC days at Windsor Park, WAFL Grand Finals at Subiaco and Sunday nights at Rossmoyne watching the winners. We will really miss you mate. Vicki and Barrie Duball and family. 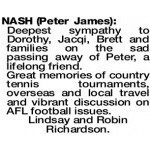 Deepest sympathy to Dot, Jacquie, Brett and families. 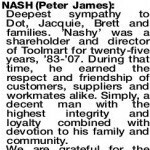 'Nashy' was a shareholder and director of Toolmart for twenty-five years, '83-'07. During that time, he earned the respect and friendship of customers, suppliers and workmates alike. Simply, a decent man with the highest integrity and loyalty combined with devotion to his family and community. We are grateful for the privilege and pleasure of knowing Pete and for the reward and fun of working and playing alongside him. Rest peacefully good friend. 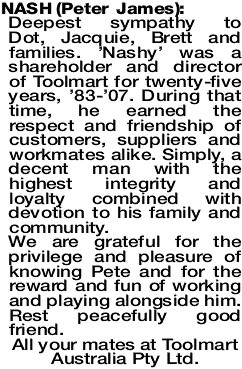 All your mates at Toolmart Australia Pty Ltd.